This November Trio d’Argento is in town with a wonderful variety of interesting musical gems. 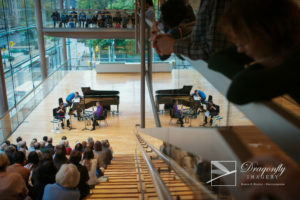 There’ll be old classical friends like Haydn, Franz Schubert or Camille Saint-Säens, as well as American Russell Peterson’s cool trio touching on jazz and world music, or the brand new piece by Toronto composer Kevin Lau that uses music to introduce the principles of quantum physics. Trio d’Argento is not your usual trio: with flute, clarinet and piano these three virtuosos perform with technical flair and musical sensitivity. Peter, Sibylle and Todd introduce their programs with humour and make the concert experience fun for the whole family! This year’s fall tour brings them to Mississauga, Toronto, Vancouver, Whitehorse, Haines Junction, Vernon and Golden. Audiences have given the trio standing ovations and rave reviews throughout their career and this is a unique concert you won’t want to miss!